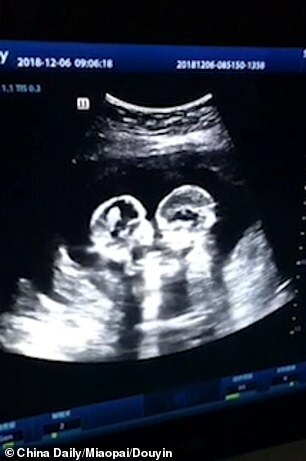 A pair of identical twin sisters have been spotted apparently fighting with each other while they were still in their mother’s womb. 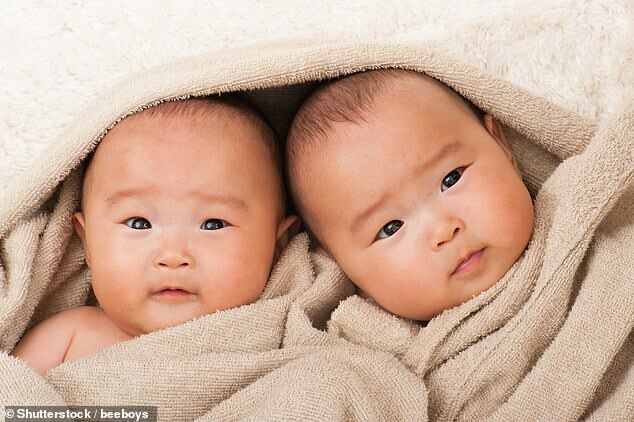 The twins’ father, 28-year-old Mr Tao, said the footage was filmed by him when he accompanied his wife to an antenatal check late last year in the city of Yinchuan. Mr Tao said he hadn’t expected his girls ‘to be internet stars before being born’. The naughty girls have been born healthy and were given the nicknames ‘Cherry’ and ‘Strawberry’ – after their mother’s favourite fruits. Another one noted: ‘They fight in [their mother’s] belly, but will love each other when they are born’. ‘We were so touched. The babies were so small and they knew how to look after each other. I believe they will live with each other in harmony when they grow up,’ Mr Tao told The Paper. The Chinese sisters (file photo), nicknamed ‘Cherry’ and ‘Strawberry’, shared the same amniotic sac as well as placenta inside their mother. They are known as the Mo-Mo twins, which are rare and occur in approximately 1 in 35,000 to 1 in 60,000 pregnancies. 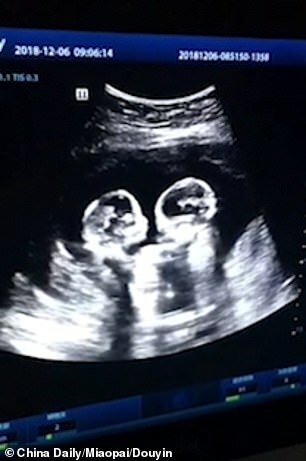 Known as monochorionic monoamniotic twins or Mo-Mo twins, it’s one of the highest risk twin pregnancies possible. There is only a 50 per cent chance that the babies will survive after the 26 week mark. The biggest risk with this pregnancy is that the umbilical cords – which are separate – will get tangled and knotted resulting in impaired blood flow to one or both of the babies. Fortunately, ‘Cherry’ and ‘Strawberry’ were born healthy on April 8 at 32 weeks via a caesarean section. Doctors at the General Hospital of Ningxia Medical University said emergency surgery was arranged after nurses saw one of the twins’ heart rate had suddenly dropped.